What could be more simple than a glass ball? How can you give intensity to such an essential profile? Matali Crasset, the designer of Eyes took inspiration from these questions in order to create a this shape of lighting diffusers, and with three spots hollowed out inside the sphere was able to obtain the two different light intensities she was looking for. 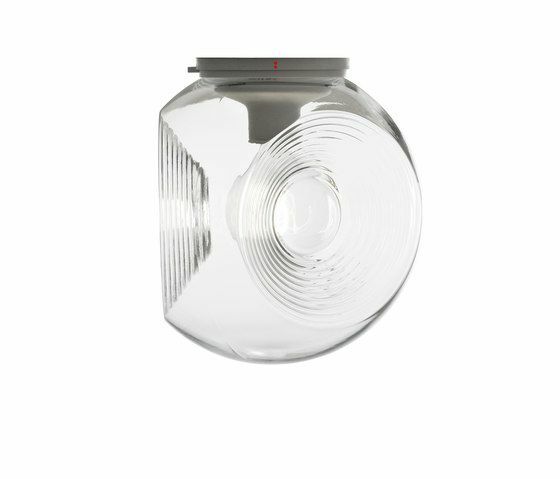 The Eyes lamp, similar to an amplifier, spreads a clear, bright energy through the fundamental glass element, diffusing light in every environment. In this particular lamp collection, the simplicity of the sphere meets the technical essence of the design, and recreates ribbed conical cones inside the grooves, to become an object that conveys character to any environment. The Eyes collection is made up of a pendant lamp, a ceiling lamp and a table lamp for indoor rooms. Available in two colour variations; transparent and white frosted glass. The pendant lamp is available with an opaque white finish and shiny copper while the ceiling and table lamps are available with an opaque white finish. The energy voltage is suitable for fluorescent bulbs.